Sony has unveiled the Reader PRS-T2, its latest touchscreen ereader that boasts two months of reading time. That's if you keep the Wi-Fi off, but it still manages an acceptable 1.5 months with it on from a two-hour charge. The fact that we've gone with Harry Potter and battery life as two stand-out features should give you an idea of how revolutionary the Reader PRS-T2 is. The touchscreen is an E-Ink affair so it's kind to the eyes, and the Reader PRS-T2 comes with 2GB of internal memory and the option to expand that using the Micro SD slot. As with all of Sony's ereaders, you can download books from the Sony Reader Store as well as sending documents and the like to the gadget using Evernote. There's pinch-to-zoom, web look-up and the ability to highlight passages if you want to come back to them later. If you're reading something particularly cerebral and want to brag about it, the PRS-T2 comes with social networking integration for Twitter and Facebook (although there's really no need to let everyone know when you're reading 50 Shades of Grey). 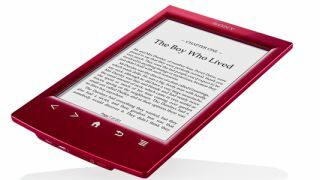 The Sony Reader PRS-T2 is up for pre-order from August 17 in an array of colours (red, white and matt black) with a stylus to boot. Sony hasn't given a delivery date or exact price yet, so stay tuned for that. But if all that wasn't enough for you, Sony's collaboration with Pottermore means that you get a free e-copy of Harry Potter and the Philosopher's Stone when you pick the reader up (as if you haven't already read it 73 times).